Cathedral Heights apartments are located in the small, serene neighborhood in the northwest section of downtown Washington, D.C., where Massachusetts and Wisconsin Avenues serve as the main hubs. Its namesake, the Washington National Cathedral, is the largest landmark in this area. Cathedral Heights is slightly removed from the greater hustle and bustle found in other areas of D.C. Equity apartment communities here deliver charming old buildings with views of the Cathedral and lush green lawns typical of this neighborhood. 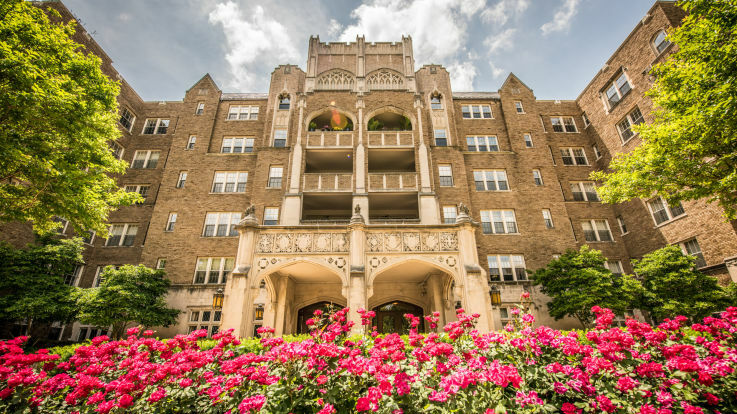 Residing in Cathedral Heights apartments is desirable for those who enjoy getting a brief reprieve from the busier areas of the city while still remaining close to favorite neighborhoods such as Georgetown, Tenleytown, and Cleveland Park. Some opt for the almost 20 minute walk to catch the Metro in Tenleytown, while others make use of the buses running along Wisconsin Avenue to get around the city. Residents in Cathedral Heights do often own cars since, in this unique neighborhood, parking is not the hassle that it is in other parts of D.C. Moreover, Equity communities in Cathedral Heights often feature garages, making parking even more convenient. Cathedral Heights is also easily accessible by foot or bike. Residents enjoy Wisconsin Avenue’s favorite dining spots such as 2 Amy’s and Café Deluxe, while also making use of the incredible stretch of Glover Archbold Park, which fills the neighborhood. At times, it can easily seem that residents here have more green space than streetscape, a noticeable amenity in the cosmopolitanism of D.C.
Equity’s Cathedral Heights apartments naturally fit into a neighborhood where apartment buildings are known for luxurious amenities and stellar service. Apartment buildings dating from the early 1900s keep residents surrounded by modern comforts, while the historical charm of the properties remain beautifully preserved. Public spaces such as a library, a media center complete with a fireplace, and a heated lap pool set these communities apart from typical apartment living. Within the units a private balcony/patio can offer views for which D.C. residents move to Cathedral Heights, while walk-in closets with built-in shelving and the option of plush carpeting or hardwood floors add to the grandeur. Those looking to enjoy the dynamic city life of Washington, D.C., but who don’t want to live in the exact center of the action, will find that Equity’s Cathedral Heights apartments are perfect for them.